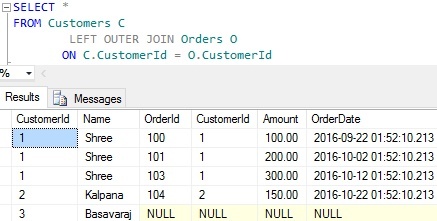 From the result we can see that for the customer with customer id =1, we have two orders in the result even though this customer has two orders because the function fnGetLastTwoCustomerOrders returns at max the last two orders for any given CustomerId. 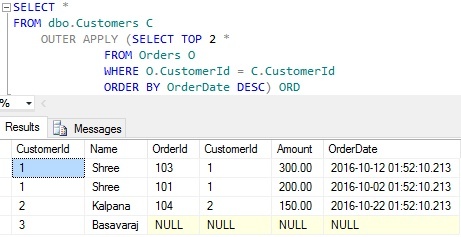 And for CustomerId =2, we see only one order detail in the result as this customer has placed only one order till now and for the Customer with CustomerId = 3 in the result we can see only the Customer details and all the Order details columns value for this customer is NULL because this customer is yet to place any order. 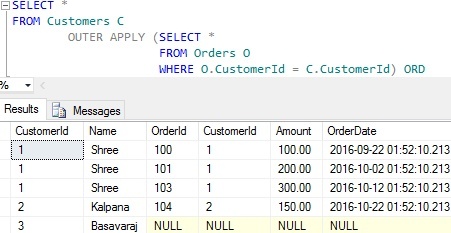 Type mistake here, “We can re-write the above INNER JOIN query using CROSS APPLY as shown below and still get the same result” instead of INNER it should be LEFT and “OUTER APPLY” instead of CROSS APPLY. Thanks Vish for pointing out the Typo mistake, corrected it.